Based in Hong Kong, Tsang Kin-Wah shows his work in Beijing, Paris, New York, and throughout the world, and he is frequently in the limelight at international biennales. 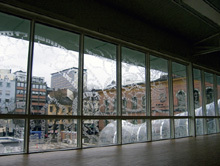 Tsang incorporates text and letters to create singular works. Some of his works look as if they are wallpaper pattern designs featuring beautiful flowers and leaves, but upon taking a closer look, the viewer will see that the designs consist of a series of English alphabet and Chinese characters that hold provocative meanings. An ongoing work since 2009, The Seven Seals is a series of seven video installations comprising texts projected onto the walls and ceilings of dark rooms. Various texts move around and propagate like living things, flying around tempestuously. Tsang poses fundamental questions for the viewer through texts on existence and values drawn from all perspectives, beginning with the Bible and including politics and philosophy. The latest installation in the series The Fifth Seal will be shown at the Mori Art Museum. With all four walls in the gallery enveloped in text, this dynamic installation incorporates sound and is to feature bracing provocations that will jolt the body and mind of the viewer. 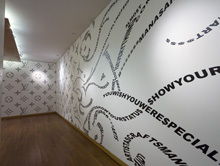 Immersed in an overwhelming storm of words, a broad range of feelings is sure to well up in each viewer as they recognize the meaning of the texts hidden in the visual beauty of the installation. "Metabolism, the City of the Future" and Tokyo City View Observation Deck (excludes Sky Deck).